A Gallup poll reports the percentages of vegetarians and vegans in America. Want to see how they got these numbers or argue with the results? The methods are here. GlobalData, a data and analytics company., says vegan diets will be even more popular in 2018. Great Britain: In 2017, 3% self-identified as vegan, compared with 0.8% in 2014. U.S.: In 2017, 5.5% self-identified as vegan, compared with 1% in 2014. The rising number of vegans and how fashionable the cuisine now seems to be, big companies are taking notice; the number of vegan options will increase in both supermarkets and restaurants…These trends will combine to make 2018 the best year yet, in which to follow a vegan diet. Evidence: McDonald’s is going vegan—at least in Sweden and Finland. The sandwich, which has already been tested at a handful of McDonald’s locations in Finland, consists of a soy patty, bun, tomato, lettuce, pickles, onion, ketchup, mustard, oil and an egg-less sandwich sauce…McDonald’s said the burger will be on its permanent menu in the two countries, a response to “more and more” people wanting to eat “plant-based food” that is better for the environment. Mintel: Nearly 10% of new food launches in Sweden this year were vegan items, according to research firm Mintel. That’s up nearly eight-fold from 2012. Nestle: is buying the Sweet Earth, which makes vegan and vegetarian burritos and burgers. Euromonitor: Global sales of vegan-labeled foods increased by nearly 8% last year to $12.8 billion. Shprintzen AD. The Vegetarian Crusade: The Rise of an American Reform Movement, 1817-1921. University of North Carolina Press, 2013. A fascinating account of the nineteenth-century origins of the vegetarian social movement to improve American morality and health. The book stops in 1921 when the Vegetarian Society disbanded, but that movement’s legacy is today’s passionate vegetarians, who comprise a vital part of the current movement to improve food systems and the health of people and the planet. 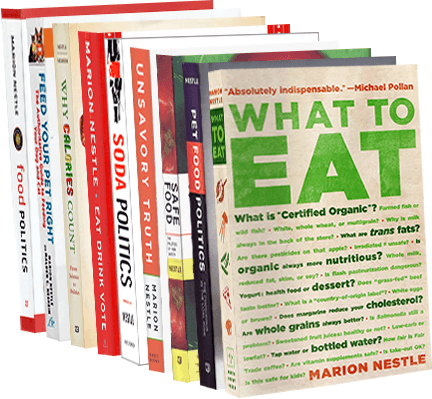 Mark Bittman’s new book, Vegan Before 6:00 or, as he likes to call it, VB6, is now out. Someone who has built an entire career on my love of cooking and eating good food. And VB6 is the way I eat now, and have for six years…VB6 is also realistic…it also maintains that you can love food that tastes good—and eat a lot of it—while you improve your health. …But you don’t help to go VB6…you need only a commitment to refrain from animal products and hyperprocessed foods until dinner time. Good idea. It worked for him and should work for others. If you are in New York and want him to sign a copy, Bittman is being interviewed tonight at 7;00 p.m. by Sam Sifton at the Barnes & Noble on 17th Street. My post on vegetarian and vegan diets elicited so many comments that I thought it was worth recycling for my monthly (first Sunday) column in the San Francisco Chronicle. It appeared today. I can’t believe the number of times I have been asked that question but it has just come up again in the context of recent complaints about the health and environmental hazards of eating meat. So here, once again, is my nutrition academic’s take on the nutritional implications of vegetarian diets. Full disclosure: I eat meat. Humans are omnivores and I am one nutritionist who fully subscribes to basic, if banal, principles of healthful diets: variety, balance, and moderation. As I explain in my book, What to Eat, if you eat a variety of foods within and among groups – meat, dairy, fruit, vegetables, and grains – you don’t have to worry about nutritional details. As long as calories are adequate and the foods are relatively unprocessed, the different kinds of foods complement each other’s nutrient contents and provide everything that is needed in reasonable amounts and proportions. Why anyone would question the benefits of eating vegetarian diets, or diets that are largely vegetarian is beyond me. People who eat vegetarian diets are usually healthier – sometimes a lot healthier – than people who eat meat. Vitamin B12 is found only in foods of animal origin – meat, dairy, eggs, or fish. With this one exception, fruits, vegetables, and grains provide plenty of the other vitamins and minerals. Vegans who obtain enough calories from varied plant food sources should be taking care of those nutrients as well as protein. On the protein question: Foods from animals are higher in protein than those from plants. Their proteins are of somewhat better quality, meaning that they more closely resemble human proteins. If calories are adequate, protein is rarely a problem. Protein is hardly lacking among Americans. The protein requirement is about half a gram for each pound of body weight, which works out to 55 grams for a 120-pound woman and 65 grams or so for a 180-pound man. On surveys, women report eating a daily average of 70 grams of protein, and men 100 grams, and these amounts are likely to be underestimates. Even vegans get more than enough protein from grains, beans, and vegetables as long as they get enough calories. In relatively unprocessed foods, protein is closely linked to calories. Diets with enough calories usually contain enough protein unless the diet is unusually restrictive or includes a lot of junk food. Think about it: entire civilizations – in ancient Egypt, China, and Mexico, for example – were based on wheat, rice, beans, or corn as sources of protein. We used to think that vegetarians had to be careful to combine plant foods (beans and corn, for example) to get enough protein but we know now that variety and calories take care of it. Developing countries are another matter. In places where food is scarce, children thrive better when they are fed a little meat (or dairy, fish, or eggs) along with whatever else they are eating, but a richer plant-based diet also works well. That brings us to children. Is it OK to feed vegetarian diets to kids? This too depends on what is meant by “vegetarian.” If the diet restricts just beef or red meat, it poses no problems. Dairy foods, fish, and eggs are adequate substitutes. And keeping sodas and junk foods to a minimum is always a good idea. Vegan diets are another matter and I can think of plenty of reasons why they are controversial for children. Supplements can take care of kids’ needs for vitamin B12 and other nutrients, but calories can be a serious problem. Children sometimes have a hard time when they have to get all their food energy from vegetables, grains, or beans. I advise vegan parents to pay close attention to calories, to make liberal use of olive oil and nut butters, to make sure plenty of beans, grains, and potatoes are available, and to monitor their children’s weight in comparison to lines on standard growth charts. Except for the most restrictive diets, I wouldn’t worry at all about vegetarian diets for adults or for kids. They have plenty of what’s good for health and a lot less of what is not so good. The health advantages can be impressive. So eat your veggies!